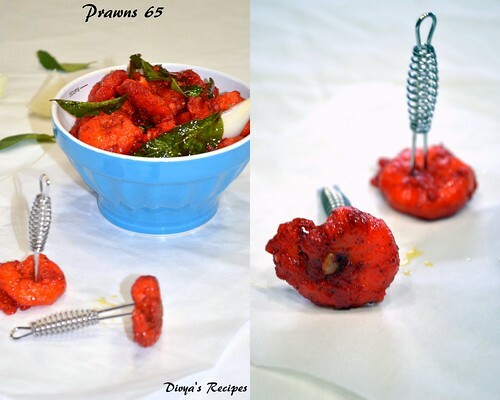 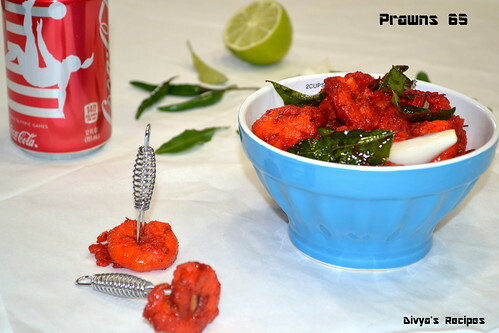 Coming-back to today's recipe -Prawns 65 is yummy n tasty dish..try and enjoy!!! 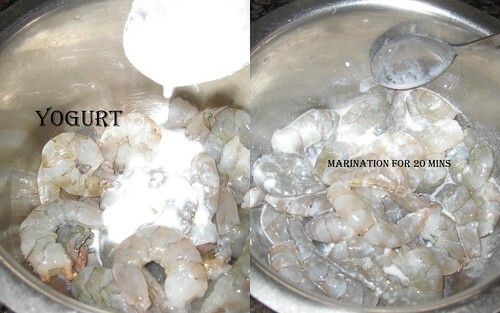 Shell and Devin the prawns and wash it thoroughly.Drain the water completely and add 2 tbsp of curd mix well keep it for 20 minutes and wash again and drain the water and keep aide. 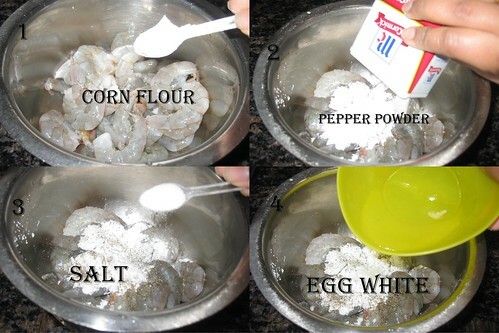 it helps all the prawns smell will go!! 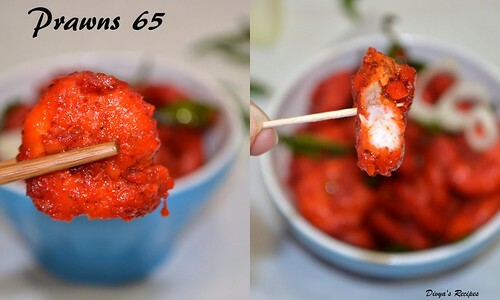 Now add corn flour,pepper powder,egg white and salt mix well.Keep it for 1 hour. 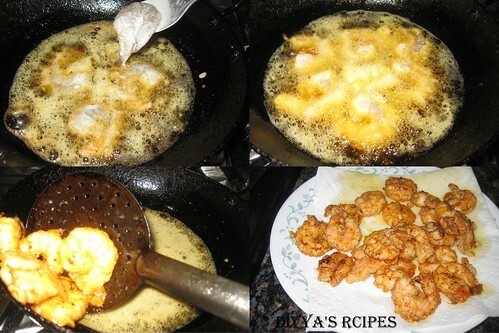 Heat oil for deep frying.Once the oil is hot,add a few prawns into the oil and cook on medium flame.Once the prawns is almost cooked,increase flame and deep fry the prawns till golden brown. 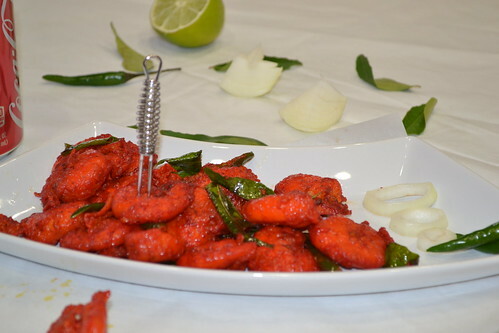 Remove onto absorbent paper.Keep it aside.Repeat with rest of the prawns. 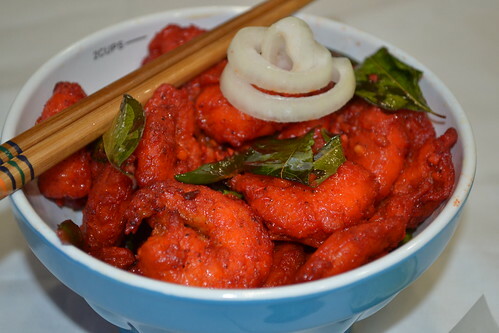 Heat a cooking vessel,add a tbsp of oil,add garlic pieces and saute for a few seconds.Add green chillies and curry leaves.Saute for few secs.Add the deep fried prawns and toss well.and cook for 2 mins. 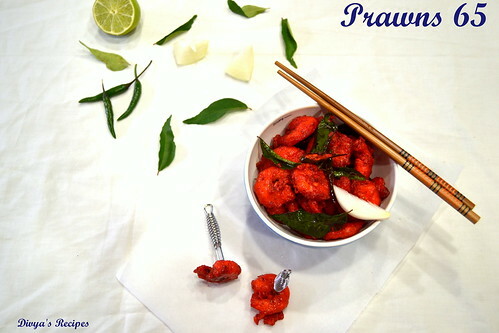 Add the yogurt ,food color and salt and cook on low to medium flame,mixing the contents well.Toss the prawns till the yogurt dries up and the prawns absorbs the yogurt. 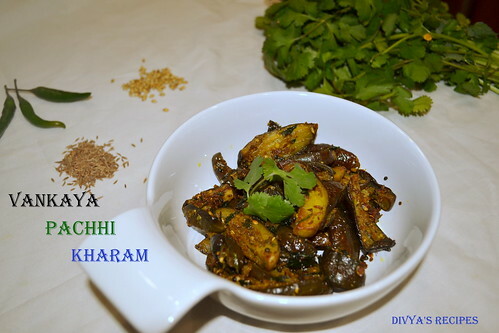 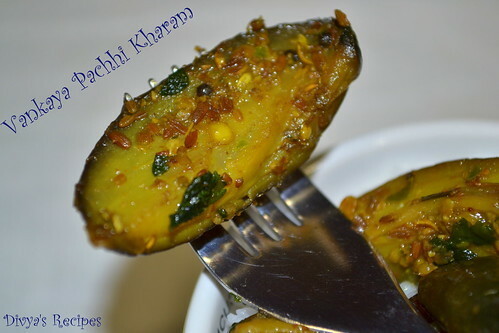 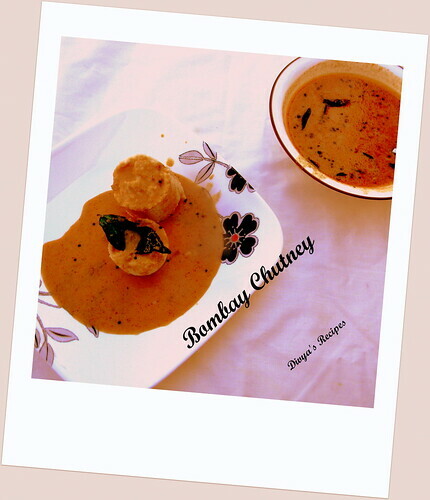 Remove onto a serving plate.Garnish with coriander leaves. 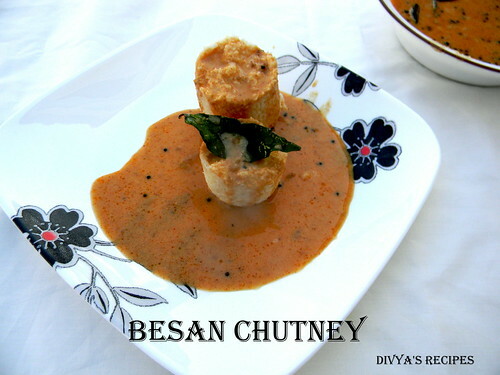 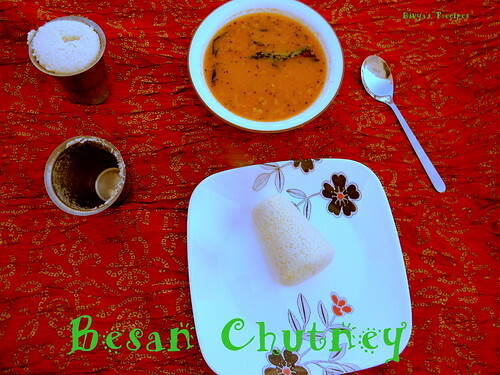 In a pan,dry roast the besan in a medium low flame,constantly keep frying the besan till it change light brown color(lovely aroma emanates and the rawness of chickpea flour disappears). 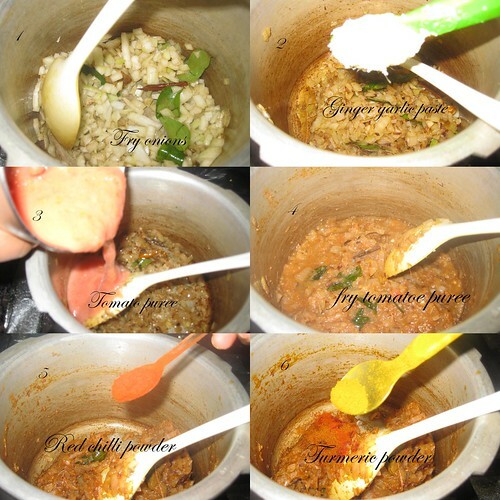 It will take 10 minutes.Take care not to burn the flour.Turn off heat.Remove and cool. 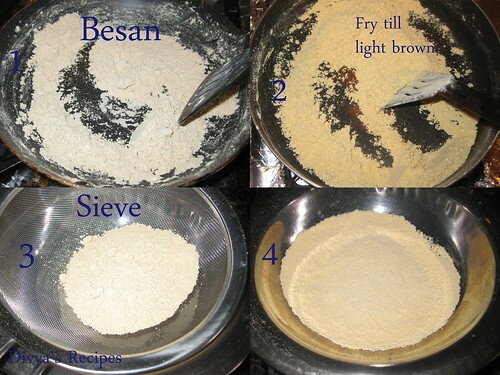 Sieve the flour nicely onto a bowl. 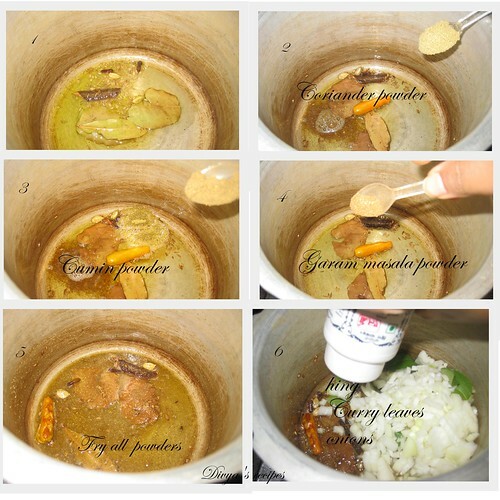 Now add the tamarind water and salt combine well.It should be of a slightly runny consistency..Add more water if required.Now check the taste tangy and salt flavor. 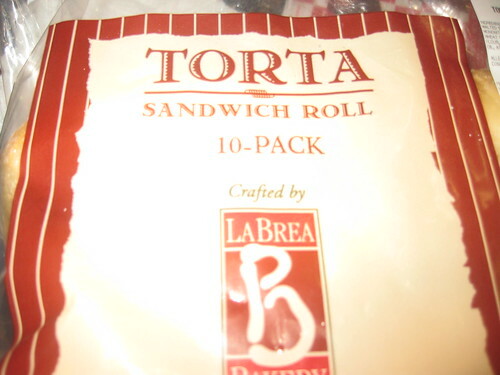 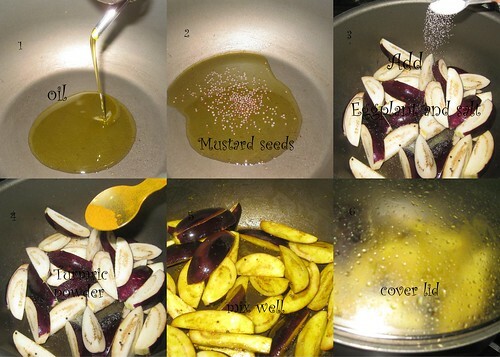 If u need add the tamarind extract and salt. 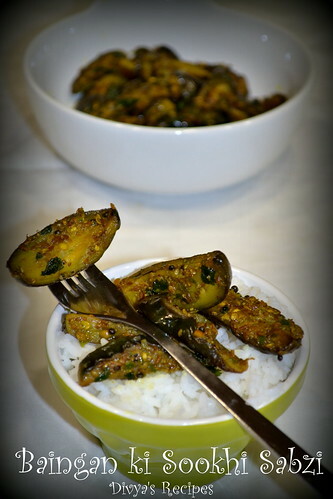 Heat 1 tsp of oil in a pan add the mustard seeds and as they begin to pop add red chillies ,ginger,hing and curry leaves and toast them for a half a minutes. 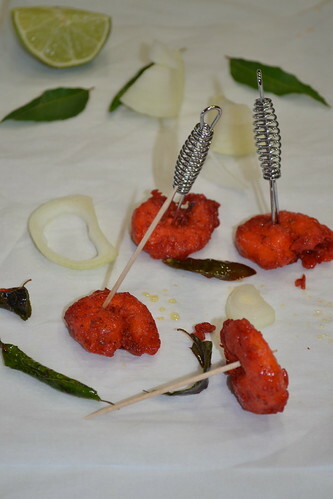 (take care not to burn the tempering). 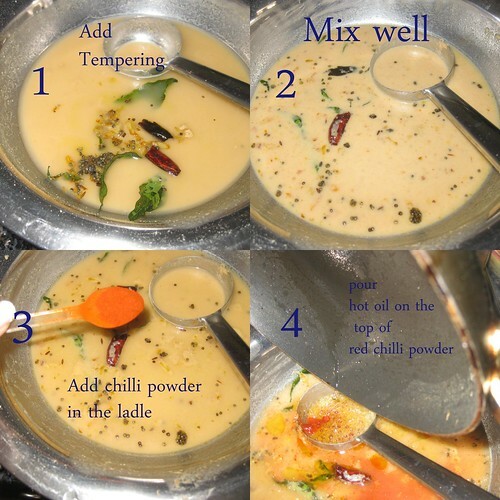 In the ladle add red chilli powder keep it aside. 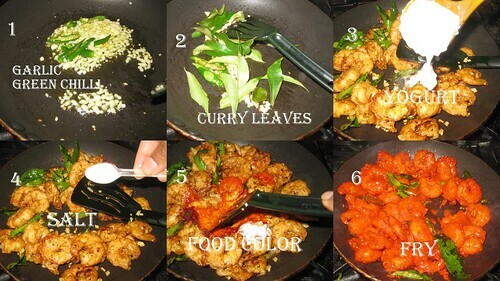 Now again heat same pan add the 1 tbsp of oil when oil is very hot,pour hot oil on top of the chilli powder.Mix with the chutney (it give nice flavor and color to chutney). 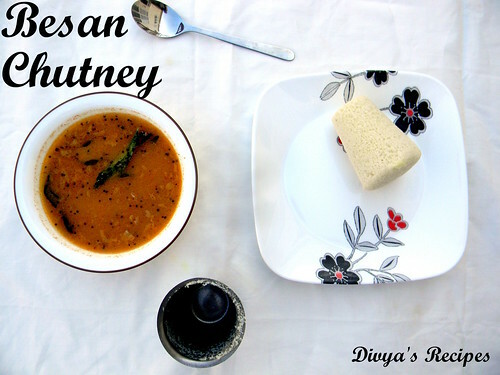 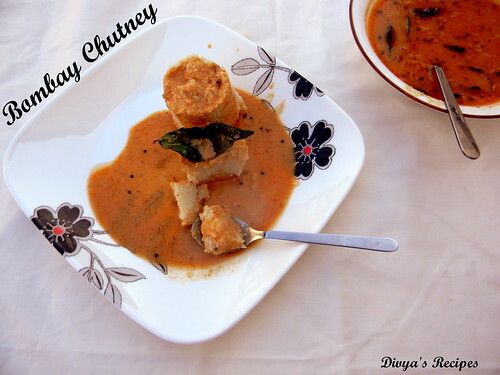 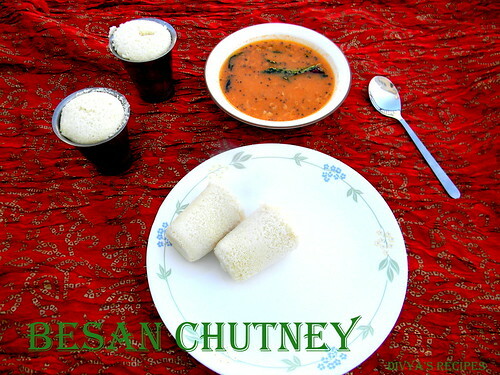 Serve with Idly and upma is best combination. 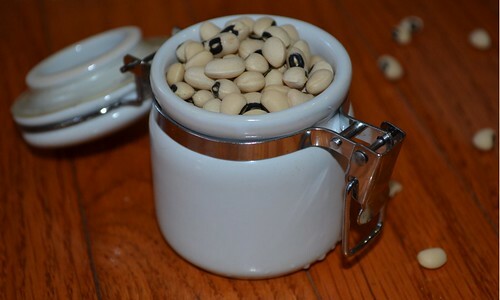 Soak black eye beans 6 hours and wash well a couple of times. 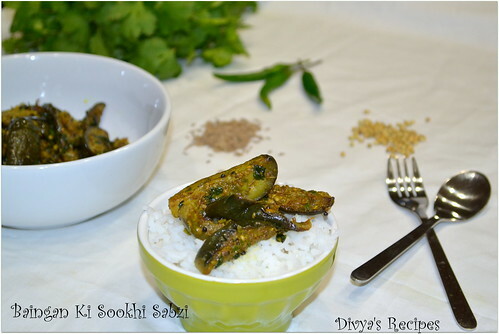 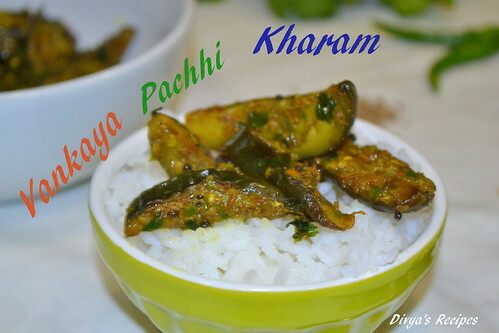 In a small pressure cooker heat oil and add cinnamon,bay leaf,cloves,cardamom,green chillies,hing curry leaves and fry for a minutes,add garam masala ,cumin powder,coriander powder and fry for 1 minutes. 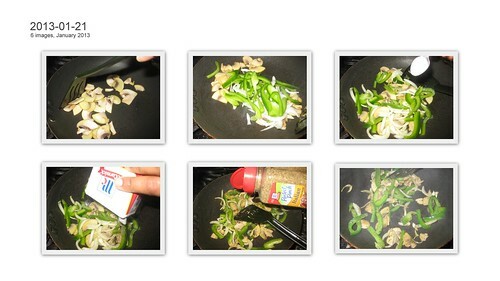 Add finely chopped onions and fry until its soft,now add ginger-garlic paste and fry until the raw smell goes away. 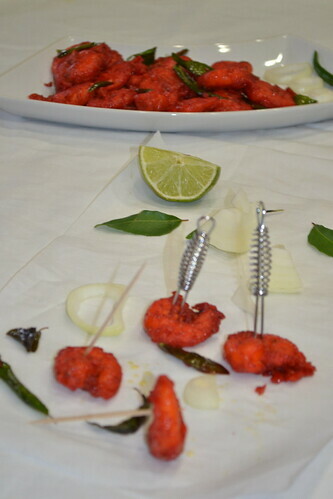 Add ground tomato puree and fry it well.Add red chilli powder and turmeric powder fry until the masala leaves the oil at the edges. 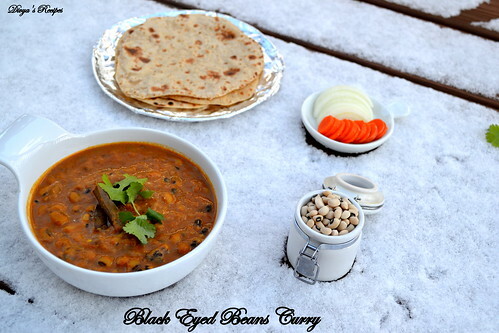 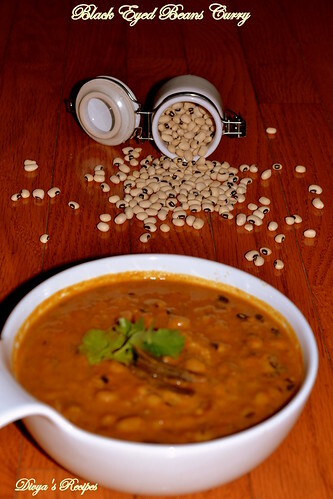 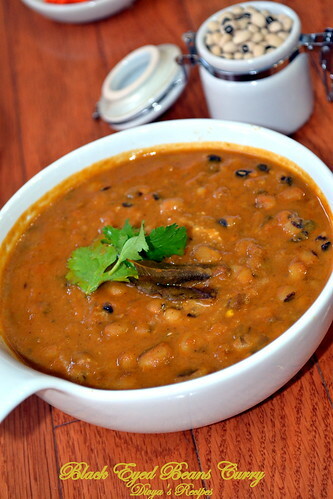 Add soaked black eye beans ,coriander leaves ,salt and 1 cup of water ,mix well and cover it with lid and pressure cook for 2 to 3 whistles . 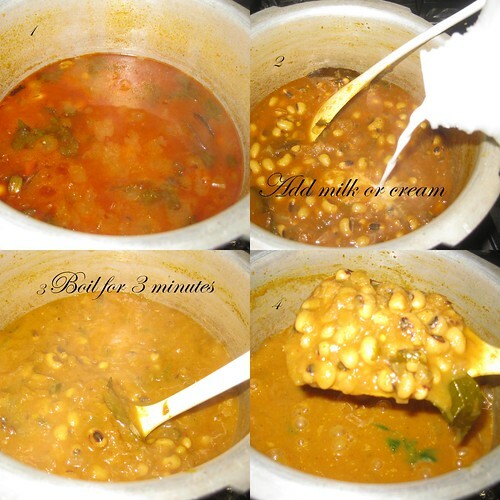 After the pressure drops add milk or cream and reheat it for 3 minutes over a low flame and switch off immediately.Do not cook for more time after you add cream or milk to it,otherwise it will curdle. 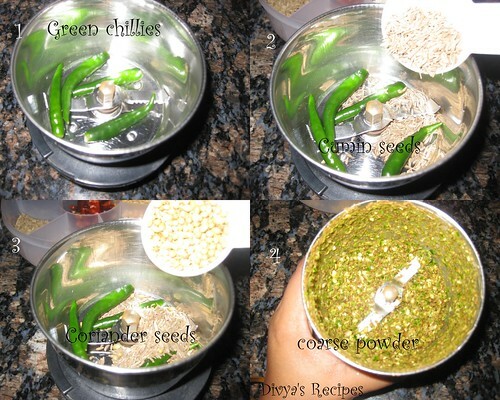 Add coriander leaves give a stir. 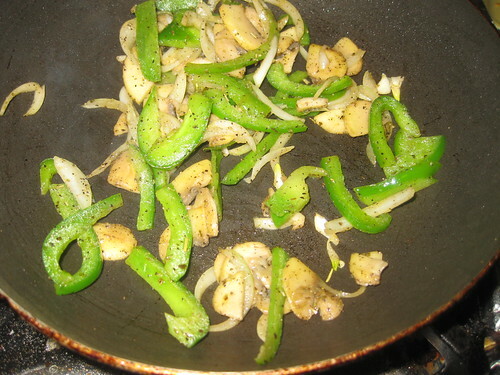 Take a frying pan and heat 1 tsp of oil in it.Add the mushroom fry for 4 minutes,then add sliced onions,green peppers,add salt,black pepper powder,Italian Season,stir till all the veggies half cooked and don't burn any veggies. 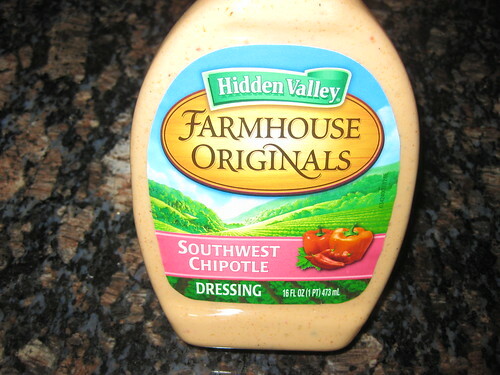 Take bread and slice the bread in half lengthwise.Spread the southwest chipotle dressing on bread. 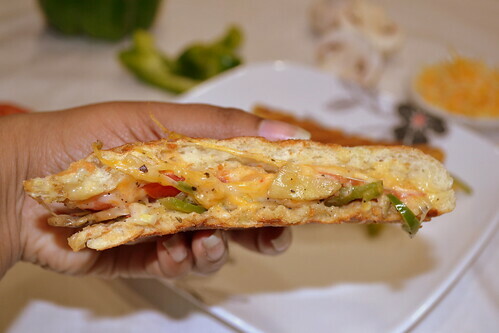 Place some filling on one side of the bread ,tomatoes slices and finally top it with cheese slices.Cover it with the other bread slice. 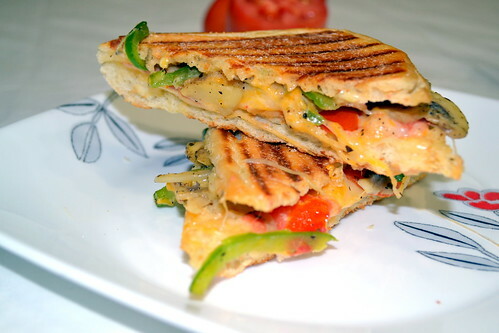 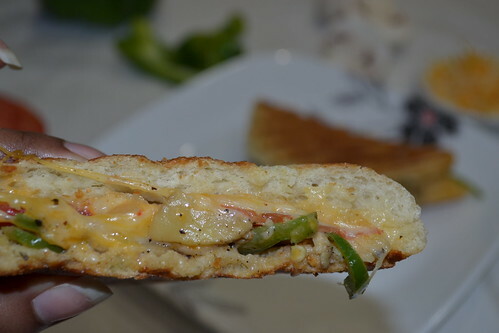 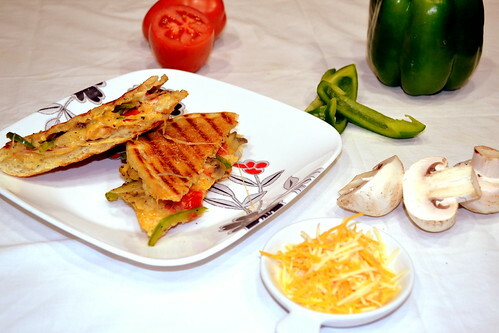 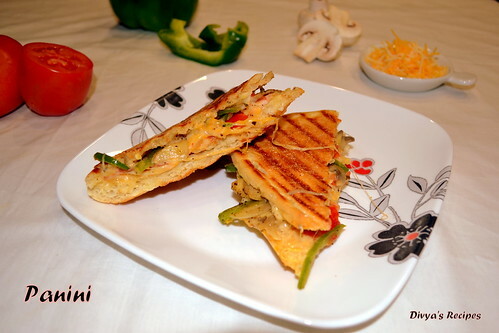 Heat the panini maker or grill over medium heat. 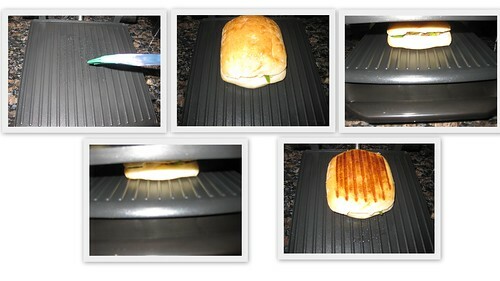 Apply oil on top and Keep it in the panini Grill for around 5 minutes or until it is done. 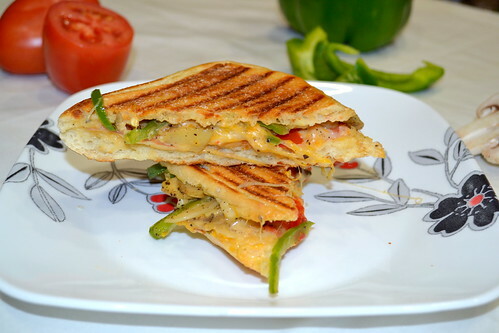 We can add any vegetables like zucchini or cucumber which we use in sandwiches. 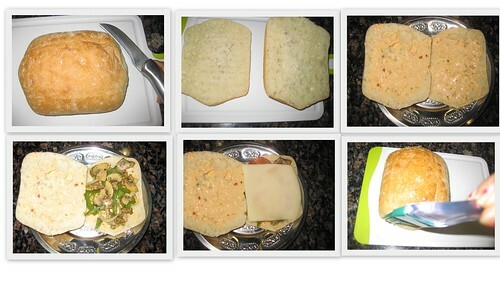 U don't have panini maker u can make on frying pan place the bread and put a heavy weight on top for 5 to 9 minutes.